More than skillets, these cast iron pieces from Lodge will help you get 2018 cookin'. 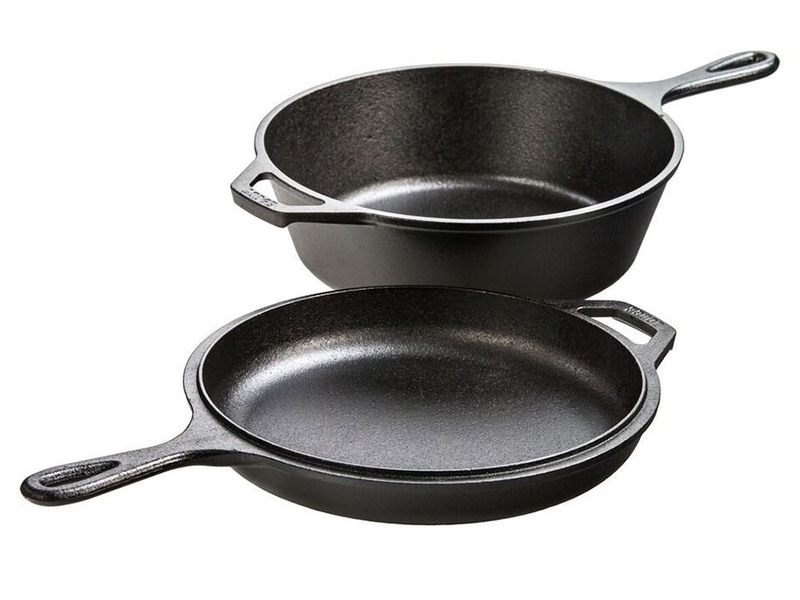 Whether you're a new chef or seasoned veteran, there's one ubiquitous cast iron you'll find recommended above all others: Lodge. Founded as the Blacklock Foundry in 1896 by Joseph Lodge in the town of South Pittsburg, Tennessee, the company now known as Lodge Manufacturing Company continues to make a variety of cast iron cookware that cooks love to this day. 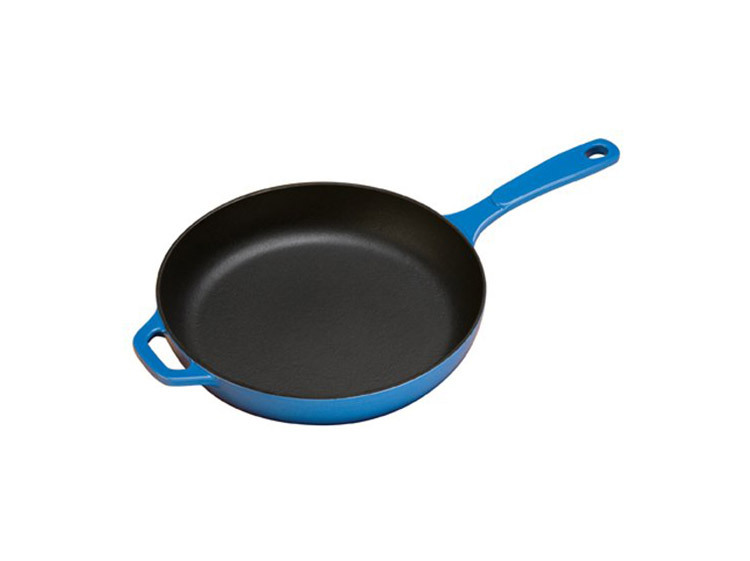 With, it's worth noting, a price tag quite a bit lower than many other, equally-acclaimed cookware manufacturers. When you think of Lodge, you probably think of its distinct cast iron skillets, but from enameled dutch ovens to more specialized accessories, there's a whole range of equally great Lodge products that will take your kitchen to the next level in the new year, and each one for under $100 at that. 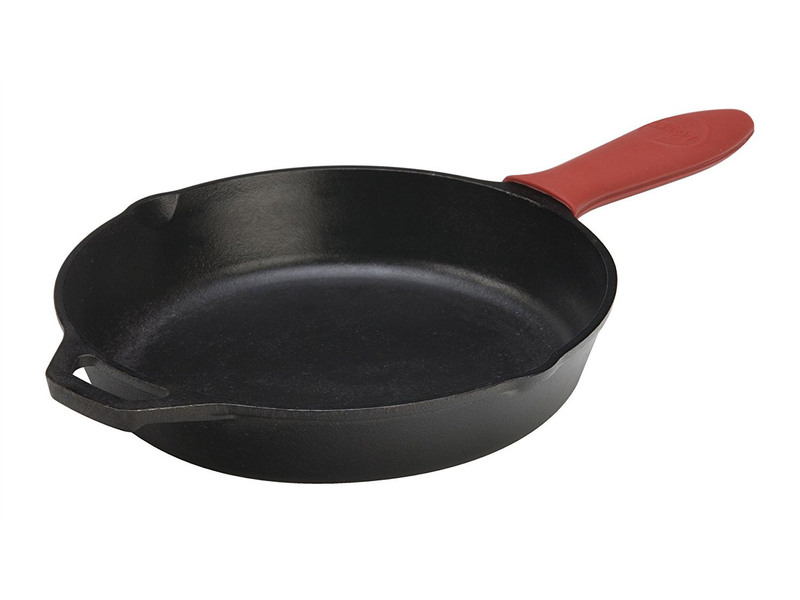 But first, the standard: a top-of-the line, preseasoned skillet that will last you the rest of your life. 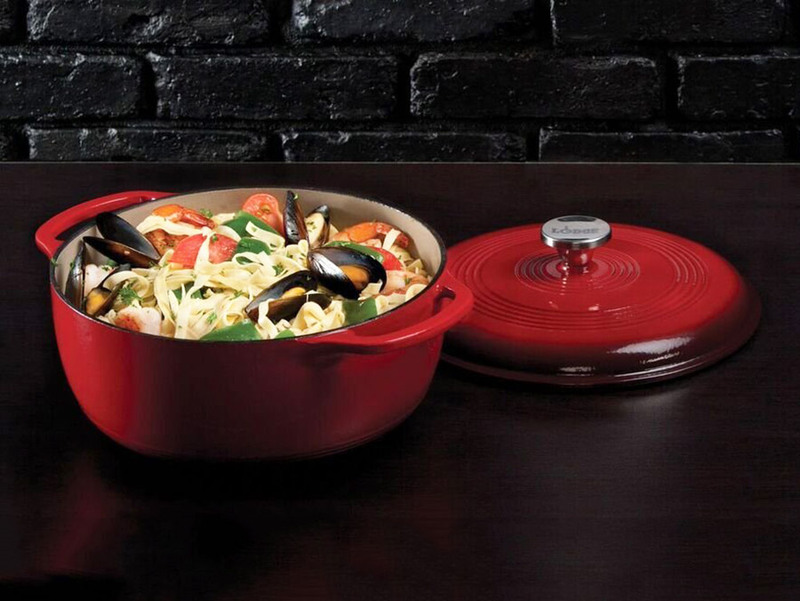 With its mastery of the cast iron core, it makes sense that Lodge has some of the best enameled dutch ovens out there. 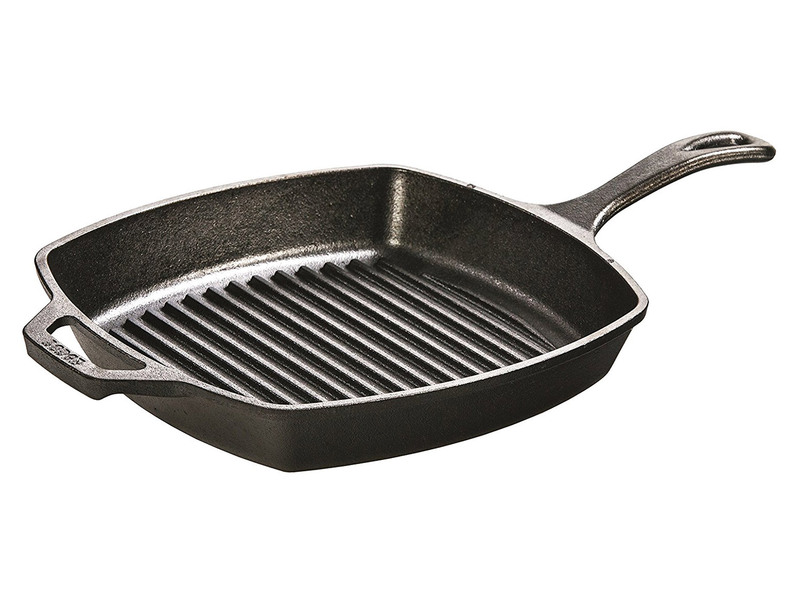 If you plan on grilling indoors, this cast iron grill pan will get you some serious heat. If you want to get the maximum kitchen improvement for your money, the Lodge LCC3 is essentially a dutch oven, shallow pan, and deep skillet all in one. 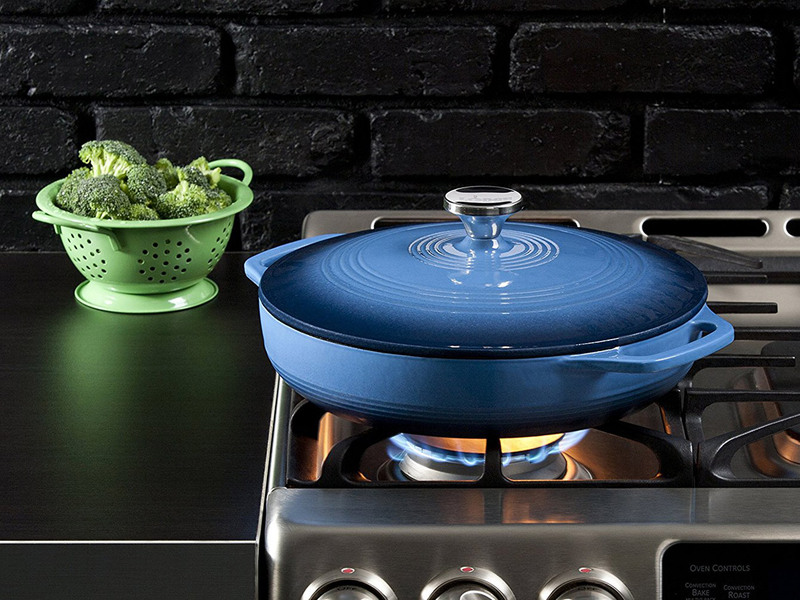 If casseroles are your preferred pan style, this colorful model should do the trick. 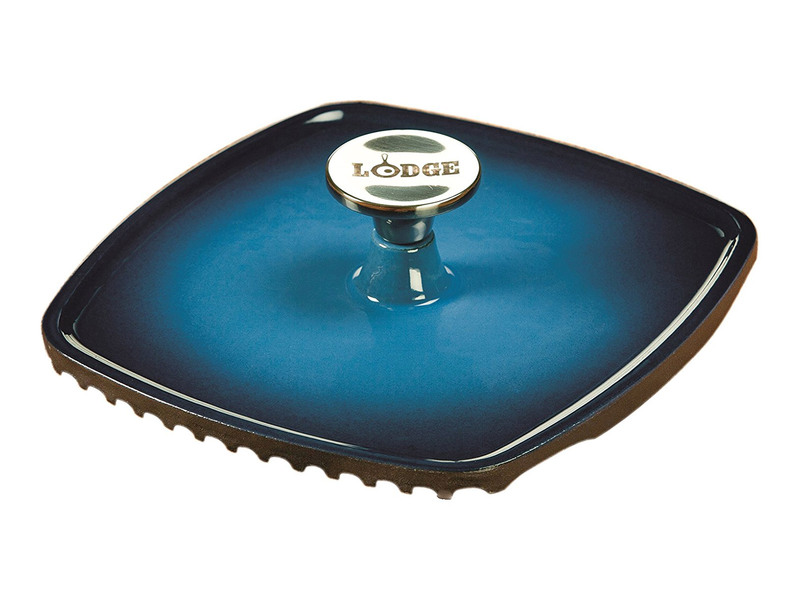 An enameled take on the classic Lodge skillet could be the best of both worlds. 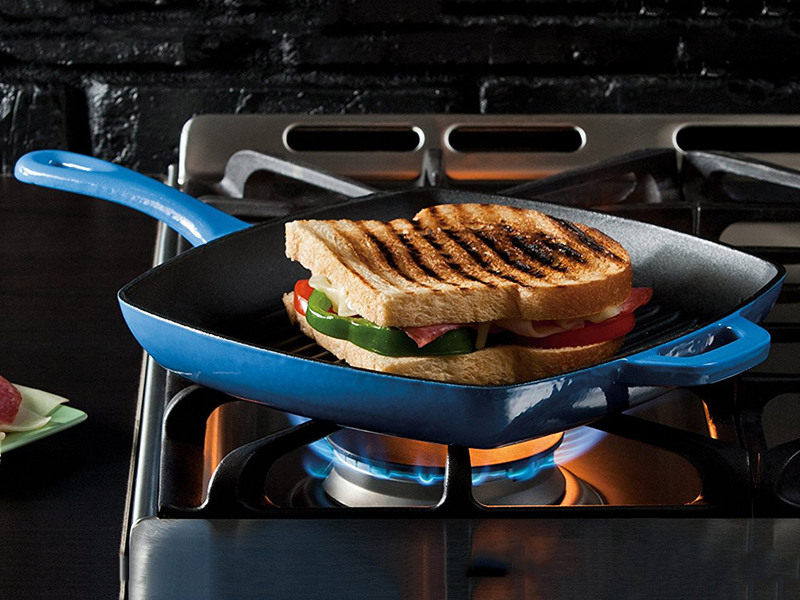 Similarly, this enameled grill pan is a great choice for those looking to add grill-ability and color to the kitchen. But it's not all pots and pans. This stylish Panini press pairs perfectly with the above grill pan for a unique addition to any sandwich lover's kitchen. 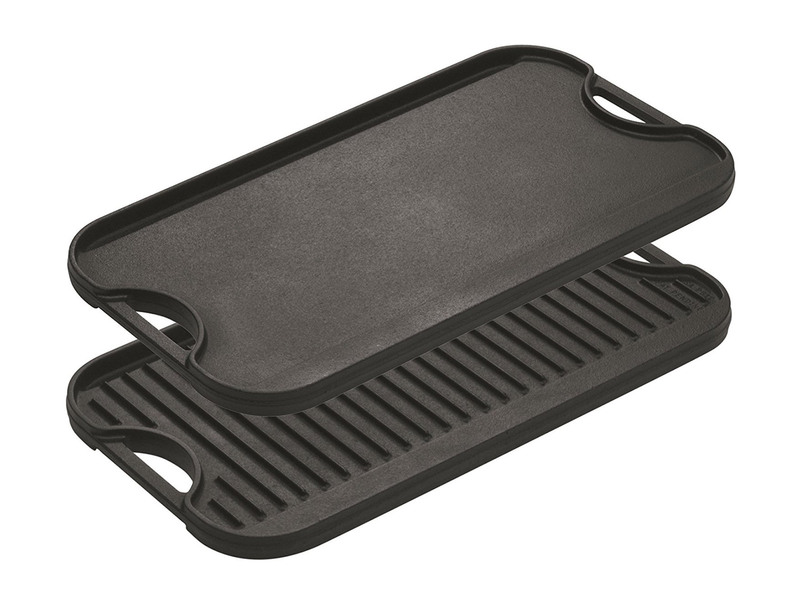 Bring a bit of that restaurant-style griddle home with this massive reversible pan, which also features an extra-large grilling side. 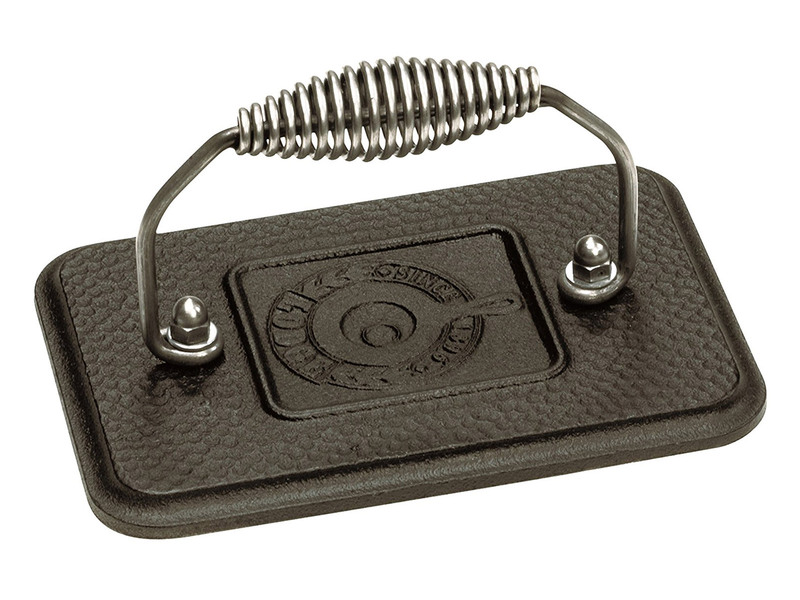 And while you're grilling it up, use this matching grill press to decrease cooking time and keep your bacon flat. 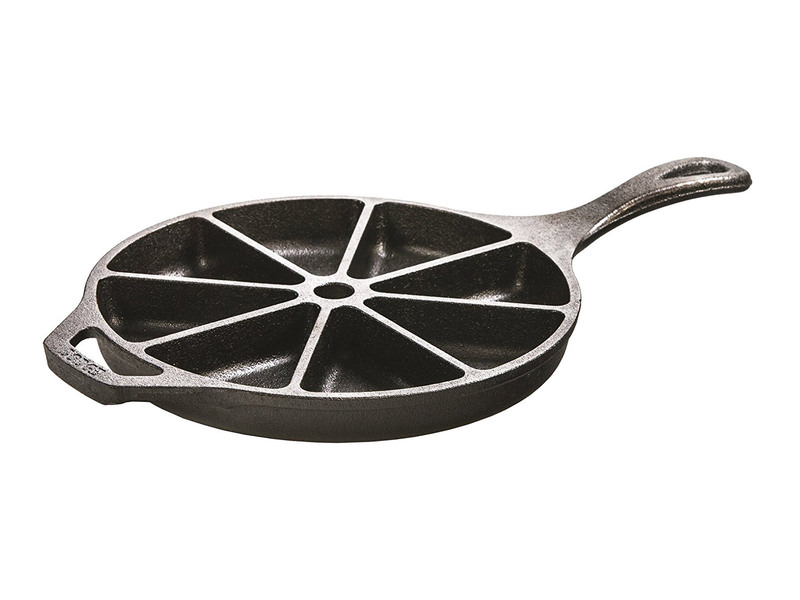 This specialized pan is perfect for those looking to home cook cornbread, scones, and other wedge-shaped delights. Bonus! 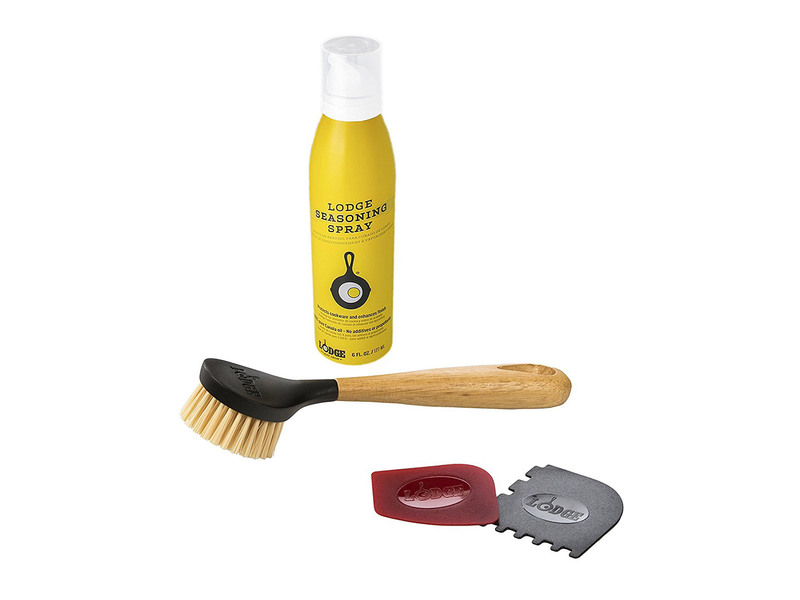 Once you have all that great cast iron, make sure lasts just about forever with Lodge's official, easy-to-use cast iron care kit.